Service One Transportation Inc. Receives National Safety Award from Great West Casualty Company. 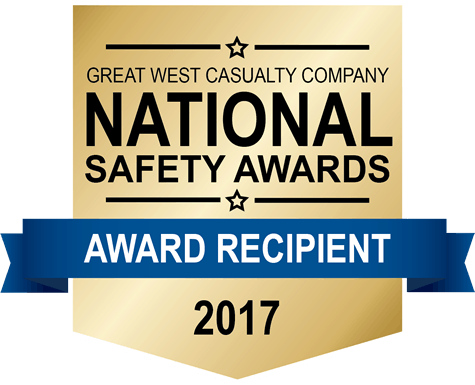 Plymouth, WI, April 25, 2018 – Service One Transportation Inc., was presented a National Fleet Safety award by Great West Casualty Company as part of Great West’s annual National Safety Awards program. The National Safety Awards program recognizes motor carriers in similar operations (truckload and less than truckload) with awards based on their year-end preventable crash results. Carriers are eligible to receive a Platinum, Gold, Silver, or Participatory award. Headquartered outside Plymouth, Wisconsin, Service One Transportation offers a full range of trucking and logistic services—including truckload, volume less than truckload (LTL) and expedited shipping—throughout the 48 contiguous United States and all Canadian provinces. Dan Flagstad, Sr. founded Service One in 1997 with a single truck; today, Dan Flagstad, Jr. along with his business partner, Mike Myszewski oversees the family-owned and operated business, which now employs more than 50 drivers. The Wisconsin trucking company has earned a reputation for unsurpassed customer service and is dedicated to “doing whatever it takes to get the job done right.” Service One is also highly regarded among drivers, offering excellent pay, full benefits and a “family-first” culture that ensures a proper balance between work and family time. For more information on Service One Transportation and its trucking, warehousing, logistics and supply chain solutions, visit www.serviceonetransportation.com.